Description: Awesome 30x15 deck on greenbelt! Impressive crown molding! Gorgeous wood laminate floors! New cut berber carpet! 4th bed down with walk in shower! Gourmet kitchen opens to family room with brick fireplace! 2 lofts! Split bedrooms! 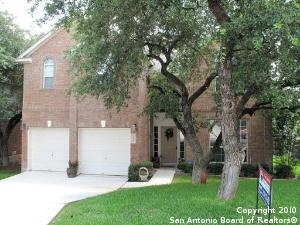 Huge master with sitting area, garden tub, walk in shower & huge walk in closet with window! 2 a/cs! Storage shed! Sprinkler system! Playfort!! Great landscaping with mature oaks! Pretty fans & stainless chandeliers! 2 inch blinds! 2993 sq ft per builder floor plan! Wow.